Gas lines and fittings are an essential utility for many homes. They furnish an uninterrupted supply of energy to homes in all seasons. However, when they are neglected, and proper maintenance is not used, they can represent a danger that is life threatening. Due to the flammable and combustible nature of natural gas, this is a concern for homeowners who want to ensure the safety of their families. Like any other mechanical structure, gas lines are prone to develop leaks over time, due to a variety of reasons. Leaks could develop due to improper installation, corrosion of pipes, or physical damage to pipes or fittings. Even a very small gas leak can result in a catastrophic event. Consequently, it is prudent to have a certified professional gas leak detection service examine your gas delivery system on a periodic basis. Gas lines are generally used to supply natural gas to household furnaces, stoves, ovens, water heaters, and fireplaces. In fact, there will likely be various gas lines that traverse a large part of your personal residence. Consequently, it is wise to have your entire gas supply system checked for leaks on a periodic basis to ensure the safety of your personal residence. If you notice the pungent odor of Mercaptan, that is added to natural gas to give it a detectable odor, contact a Melbourne area gas leak detection service immediately! If you suspect a gas leak, it is also wise to open all windows in your home to ventilate it and turn off the main gas supply valve for gas that enters your home from your local gas utility company. There are a variety of devices that can be used to detect the presence of gas in your residence. Technicians can test your entire gas system using a pressure gauge on the riser that is part of your gas meter. They apply air under pressure to your entire system in order to detect the leak or faulty gas line. If there is no leak in the system the gauge will not show a change in pressure over time, indicating a sealed, or closed system. Any pressure reduction over time will indicate a leak. 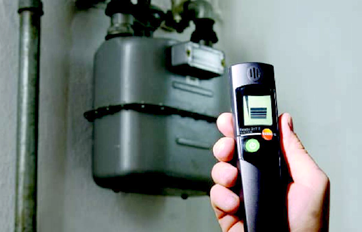 Gas leak detectors use several proven techniques to determine the exact location of a leak. They will isolate the leak to its source and then supply you with repair options. Fittings and connections to appliances that use gas are also a main source of leaks. Each of these fittings is carefully examined. Fittings are frequently checked using soap bubbles that will indicate if any gas is escaping from a fitting. Areas of your home that are generally inaccessible must also be checked when gas lines and connections run through them. Gas leak repair work must be performed by a professional licensed contractor. Most contractors that engage in gas leak repair are licensed plumbers. Generally, the source of gas to your home will be shut off while the repairs are ongoing. After completion of the repairs, the system must be tested again to ensure no leaks are present. The professional plumbers at Gas Leak Detectors, Melbourne, will promptly, and safely, repair any type of gas leak in your home and restore it to a safe condition. They can also advise homeowners regarding the safe and efficient use of natural gas in their home and provide them with maintenance tips and precautionary measures to take. They are available 24 hours a day, seven days a week. Their hotline is 1800 0 LEAKS.